A self-trained historian who was part of a teaching tandem behind the first college-level, Chinese American course in this country has died. Philip P. Choy, 90, died at his San Francisco home last week after a short illness. 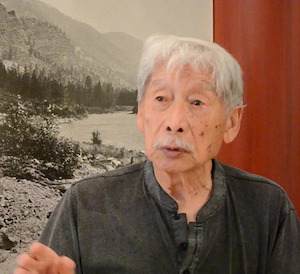 In fall 1969, Choy, along with the late Him Mark Lai, created and taught a Chinese American history course at what was then San Francisco State College. Neither was formally trained as a scholar, but both left immeasurable footprints on the institution and on modern-day, Asian American studies. At the time of Choy’s death, the university website still listed him as adjunct faculty in Asian American studies. The 1969 Chinese American course, along with others focused on race, ethnicity and identity, was offered in response to the student-led strike of more than four months on the San Francisco State campus, the longest campus strike in U.S. history. The institution’s nationally renowned College of Ethnic Studies was what eventually resulted from the strike, which ended in spring 1969. Because ethnic studies as a discipline was barely in its infancy in the late ’60s, the course taught by Choy and Lai was housed under the institution’s history department. At that time, students — along with sympathetic faculty and community activists — demanded academic courses that would feature more than just a majority White, Eurocentric perspective, along with the hiring of additional senior faculty who were non-White. An architect by training, Choy made himself into an expert on the Chinese American experience because he believed that the contributions of his forebears to the development of U.S. society had been ignored in mainstream history books for too long. Multiple books and journal articles about Chinese American life bear Choy’s name as author or co-author. Born in San Francisco, he attended public schools and served in the U.S. military during World War II. Afterward, he earned his bachelor’s in architecture at the University of California, Berkeley. His supervisor at a local architectural firm said that, because he was Chinese, he couldn’t expect a promotion. Exasperated by the blatant “bamboo ceiling,” he quit to establish his own firm, which he operated until he was well into his 70s. But even as a young man, Choy was curious about the history of his people. He joined the San Francisco-based Chinese Historical Society of America, a community group in which he became a longtime board member and, at various times, served as its president. Choy’s passion — and ire — were further fueled when he was an invited guest at the 1969 centennial celebration that commemorated the completion of the transcontinental railroad. Much of the railroad had been built by Chinese laborers—men who left their impoverished homeland specifically to work in dangerous, low-paid jobs that Whites did not want. Because of the lack of public recognition for the role of Chinese laborers, Choy immediately gave an interview voicing his outrage to the San Francisco Chronicle that, according to the newspaper, was published on the front page and drew widespread attention. When San Francisco State College educators were trying to set up some sort of Asian American course in the aftermath of the strike on campus, they invited Lai — educated as a mechanical engineer and famous locally for having already spent years piecing together Chinese American history on his own time — to create and teach a course. Not only did Lai accept San Francisco State’s invitation, but he brought Choy along with him. The flexibility to co-teach let both men juggle their new course while working full time — Lai spent three decades as an engineer at Bechtel Corporation. Like Choy, Lai was San Francisco-born, college-educated and quite active with the Chinese Historical Society of America. Lai was unusual, however, among American-born Chinese: He not only spoke more than one Chinese dialect fluently, but he could read and write the Chinese characters, allowing him to pore through Chinese-language newspapers and magazines with the alacrity of professional scholars. Meanwhile, most White scholars delving into Chinese subjects at that time lacked the language skills to do so. Further, some of Lai’s contemporaries such as Choy only had limited conversational skills in one dialect — if that much — and could recognize only a handful of Chinese characters. That made it near-impossible to explore firsthand the publications that Lai voraciously consumed, collected and from which he painstakingly gleaned key facts, statistics and anecdotes about the Chinese American experience since the time that poor Chinese laborers made the trans-Pacific journey for low-wage jobs during California’s Gold Rush of the mid-1800s. Lai supplemented his weekend and late-night readings with visits to the homes of countless Chinese Americans in the San Francisco Bay Area for oral histories and to examine their family letters, documents and personal effects. Not only did Lai’s archive of groundbreaking research that he housed in multiple, big file cabinets — which he enthusiastically opened up to academicians of all ethnicities, journalists and graduate students until his death in 2009 — help educate hungry, self-taught historians like his friend Choy, but it also provided the proverbial meat and potatoes for the 1969 San Francisco State course in Chinese American history. Course material for that seminal class was co-authored by Lai, Choy and a third man into “The History of the Chinese in California: A Syllabus,” a publication that still is repeatedly referenced nowadays. The 1969 college course taught by Lai and Choy became a model for others at not only San Francisco State, but at other institutions nationally. These early courses helped shape and form the bedrock of Asian American studies, as scholars and community activists steadily added classes focusing on the experiences of Japanese Americans, Korean Americans, Indian Americans, and many others descended from people of Asian countries, Hawaii and the Pacific Islands. Choy and Lai, meanwhile, continued their passion of documenting history while encouraging the younger generations to do the same. Both became beloved mentors to countless professors in Asian American studies. In 2005, Choy and Lai were awarded San Francisco State University’s prestigious President’s Medal for their pioneering work in education and history.